Cuboid calculator provided on this web page is a tool which can be used to find volume, total surface area and length of the diagonal of a cuboid for the given length, width and height of the cuboid. 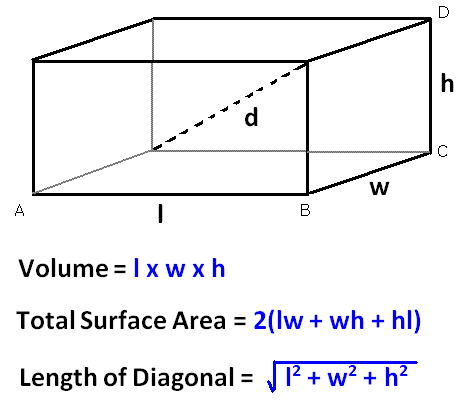 When people want to find volume, total surface area and length of diagonal of a cuboid, they can use the appropriate formulas to find the above mentioned measures.When students have lengthy problems in math, as a part of the problem, students have to find volume, total surface area and length of diagonal of a cuboid for the given length, width and height of the cuboid. When students do lengthy problems in math, they have to concentrate a lot on getting idea to solve the problem. In some situations, they may have to find volume or total surface area of a cuboid as part of the lengthy math problem. While solving a lengthy problem, doing the above work as a part of the problem will annoy them. At that time, students can use this online cuboid calculator to find volume or total surface area of a cuboid. When people do preparation of solving word problems in math, they may have to spend time to get idea on "How to solve". In some situations, they may have to find volume or total surface area of a cuboid as a part of the word problem. While they are thinking a lot to solve the word problem, they would not like to spend time to find volume or total surface area of a cuboid. Because, when people do word problems in math , they have to do this work separately and they might do some careless mistakes in finding volume or total surface area or length of the diagonal of a cuboid. It will definitely disturb the solving of word problems. And also they would not be able to use the regular calculators to find volume or total surface area of a cuboid. By using this online calculator, students will find much time to get idea of solving the word problems. Students have the topic "Area and Volume" in school level math. They may have to do lots of problems on this topic. In most of the problems, they have to find volume or total surface area of the given figure.In this topic, they may have the problems like " Find the volume of the cuboid." Students would find answers for the questions as directed in the question. But they would not be sure, whether the answer they have received is correct or incorrect. At that time, they can use this online calculator to verify their answer.